2013 Press Pass Showcase Racing is the equivalent of a marquee NASCAR match-up. 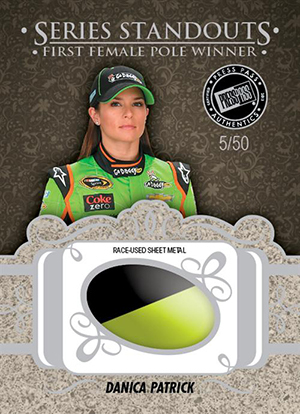 It's one of the company's premier NASCAR brands, delivering high-quality hits and lots of low-numbered cards. 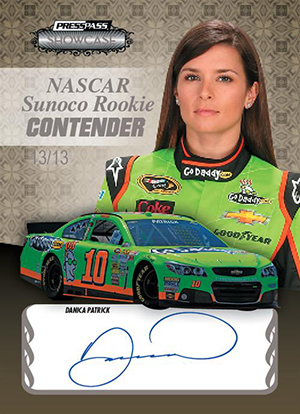 Three-pack boxes come with one on-card autograph and a pair of race-used memorabilia cards. 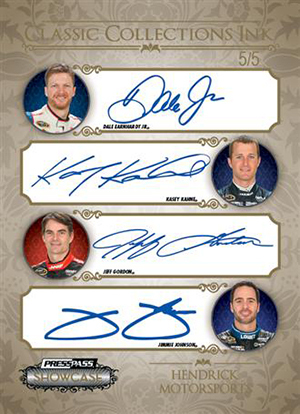 The 2013 Press Pass Showcase Racing autograph lineup focuses on top drivers and multi-signature teammate cards. 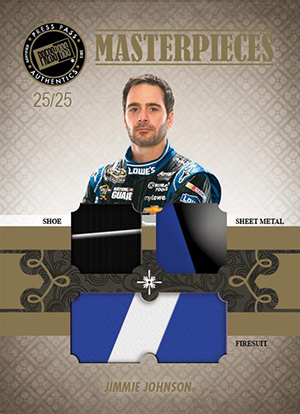 As always with Press Pass NASCAR products, encompasses a wide variety of materials. Firesuits, gloves, sheet metal and more are used. Many are paired up to make multi-swatch cards. There are also lots of jumbo swatches. 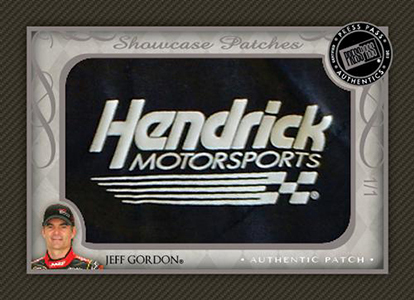 Showcase Patches use massive pieces that take up nearly the entire card. 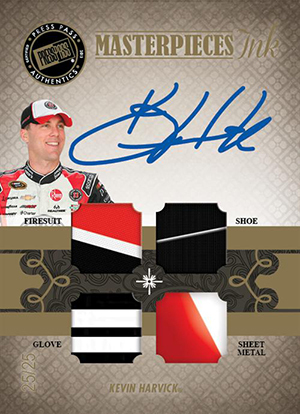 The set also has several autographed memorabilia cards and combinations. 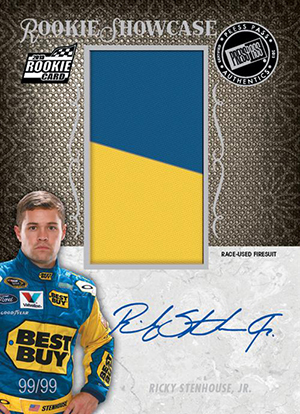 Besides a hit, every pack also comes with one limited edition card numbered to 20 or 13. 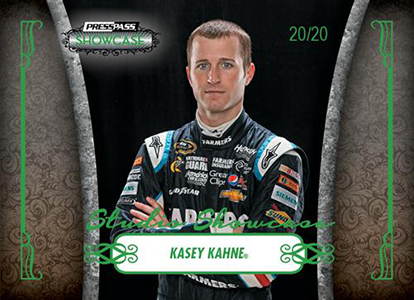 New for 2013 Press Pass Showcase Racing is a bonus box topper pack that includes more limited edition cards and exclusive inserts. 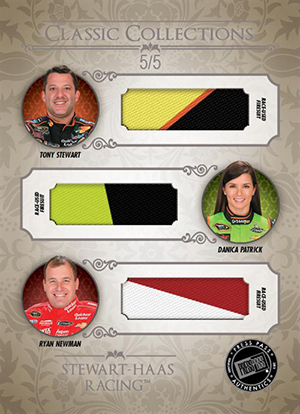 Click here for the 2013 Press Pass Showcase Racing checklist. 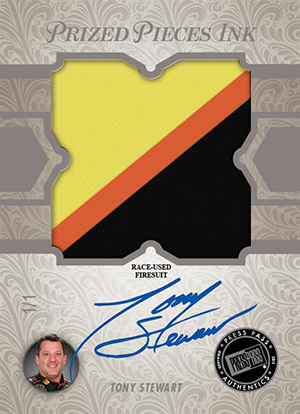 2013 Press Pass Showcase Tony Stewart Auto Elite Exhibit Ink Silver 18 20 !